Born into an old aristocratic family with a predisposition for smallpox, she spent her youth being passed from one distant relative to another (each dying within a year of the next) until age 16 when she was hired by the royal court theater as an actress. 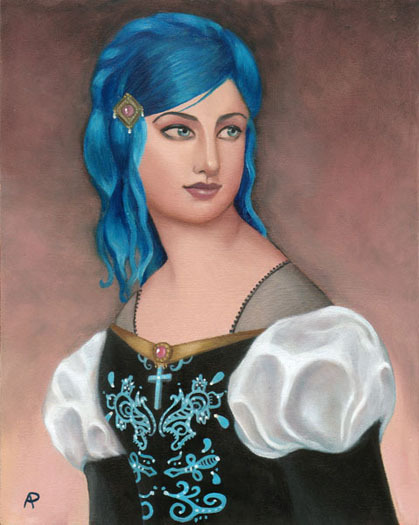 She gained the Queen’s favor as an amusing and attractive social weapon; when the Queen’s friendship with a lady in her circle had cooled, Friederica was invited to salons and galas as a replacement, a resounding snub against anyone who had fallen out of favor. Described by men who came to pay her tribute as ‘the highest creature’, it is not clear if they flocked to her for her charm, her acting, or her influence with the Queen. Setting her sights on those of the most eminent condition, she retired from the stage and married the Duke of Lernigo.